Fluidic Sculpture design theme that is carried by Hyundai, with the intention of reflecting the design philosophy of Hyundai. This makes Hyundai cars more aerodynamic and aero-acoustic, so it is claimed to be more efficient in terms of fuel, but still powerful, and the room became quieter cabin. The concept of fluidic sculpture design flow applied through natural flowing body. While on the back, it appears that dominate the wide rear glass, LED combination taillights, which shows this car to a class that is firmly established. 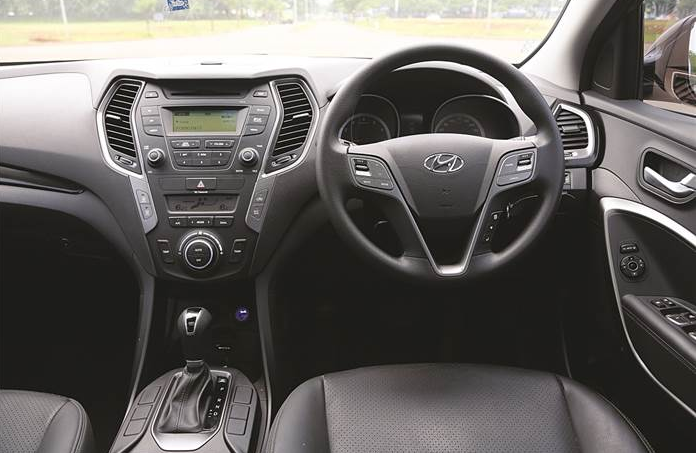 Maybe a lot of people out there who want a vehicle with a driving source silky, high ground clearance, ride comfort, and prefer to use a driver rather than driving yourself, the Hyundai Santa Fe could be one option. Unlike most SUVs, it is built on the platform and not a ladder frame monocoque which tend to be hard. Vehicle-based monocoque chassis, prefers stability, and comfort with lighter weight normally. The first time that we feel when trying this car is smooth transmission, and suspension kickback quite comfortable, not too hard and not too soft. The condition that occurs when you're sitting a passenger. When driving in automatic mode, the transmission transfer is soft, but feels a bit smothered in the early rounds. This was remedied when using manual mode. Manual shift 6-speed transmission that was reliable in a variety of road terrain. 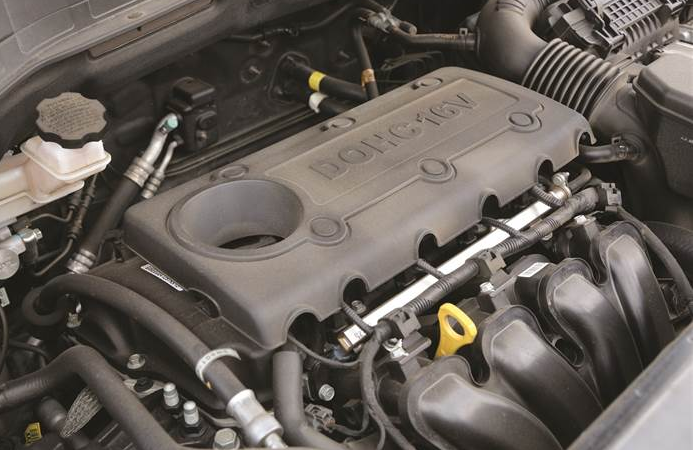 In addition, Santa Fe carrying the Theta II 2.4 L DOHC 16 valve four-cylinder engine, which is capable of thrusting power of 176 hp and torque of 225 Nm. When Santa Fe invited to run fast on the freeway, chassis combined with McPherson Struts suspension (front) and multi-link (rear) makes the car not only convenient, but also very stable and move swiftly to the right or the left, although the speed of touch in 100 kph. Even when turning sharply at medium speed, the effect of 'spill' was minimal. 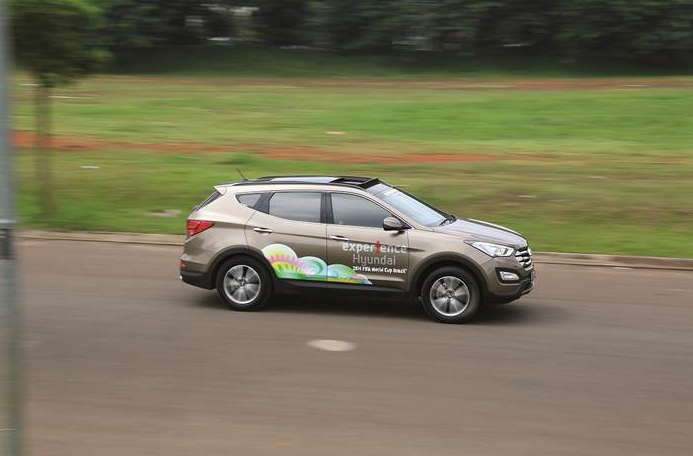 At that time also, we tried one of the security features of Santa Fe, Cruise Control. The feature works well, especially when driving a speed of about 100 mph on the freeway. By simply stepping on the brake or accelerator pedal, the cruise control system activation will be canceled and returned to normal driving mode. Another feature that is not less interesting, can be seen from the MID (multi information display) thrusting various kinds of information. Then available aC dual zone there are even eight channels aC point from the front to the third bench. 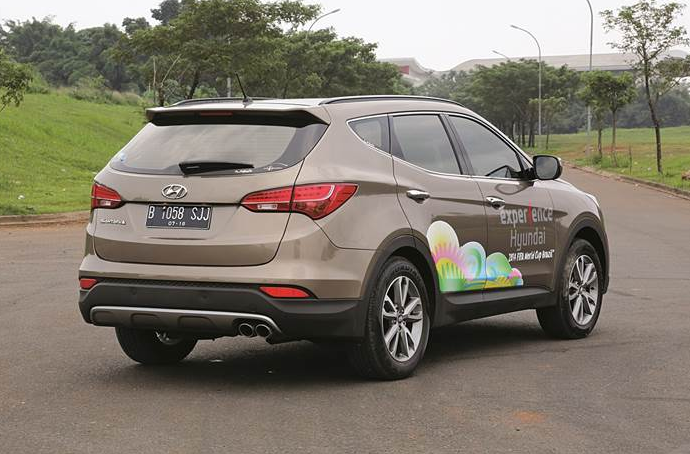 For features salvation, Santa Fe armed by dual air bags, ABS brakes and EBD. While 3D Virtual Surrounding System with 6-speakers will spoil your ears all the way. With capitalize topnotch design, utility SUV, as well as the comfort of a sedan, the Hyundai Santa Fe could be one of the mainstays of Hyundai. 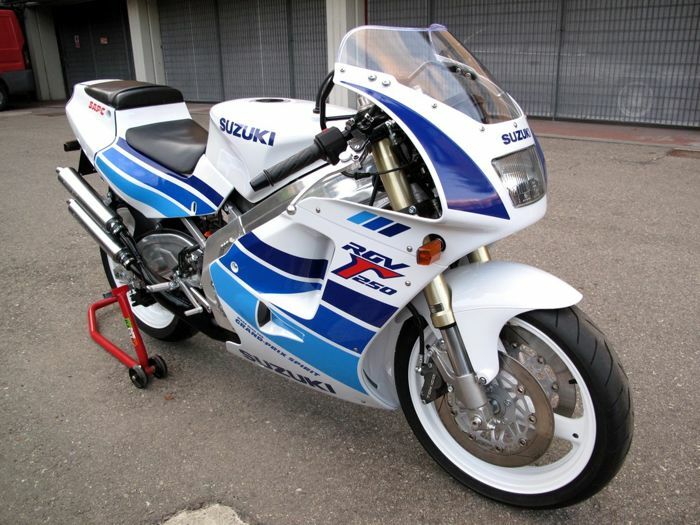 moreover the price is competitive in its class.